If you’re a ManageWP user, you have no excuse not to take a few seconds out of your day to upgrade all of your sites. However, you may be wondering what 3.4 has to offer in order to make upgrading worthwhile. The short answer is “rather a lot”. So let’s get into more detail. 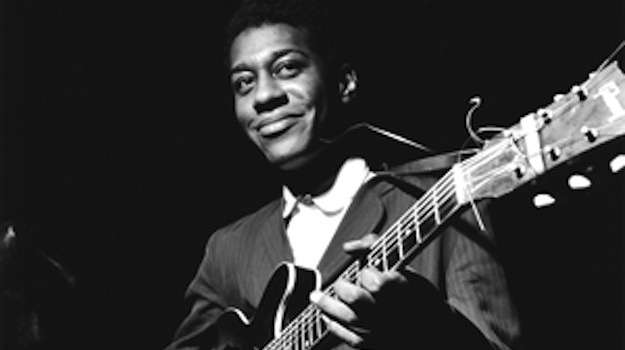 In continuing with their long-running tradition of naming updates after jazz musicians, this newest version of WordPress is named after jazz guitarist Grant Green. There are three main new features for you tuck into – what I would refer to as two great “bonus” additions, and one improvement that has been a long time coming. Let’s take a look at all three. The theme customizer must be supported by whichever theme you are using, which means that its usefulness will be limited to those themes which are equipped to handle its features. However, Automattic are no doubt banking on theme developers developing with the theme customizer in mind from now on. This major addition to WordPress is a sign of things to come, as Automattic work towards producing a very user-friendly CMS. One thing is for certain – being able to see your changes live, rather than constantly updating your site and then checking the results, is an attractive prospect. WordPress developers have in recent times worked hard to implement intuitive embedding of third party content, such as YouTube videos. 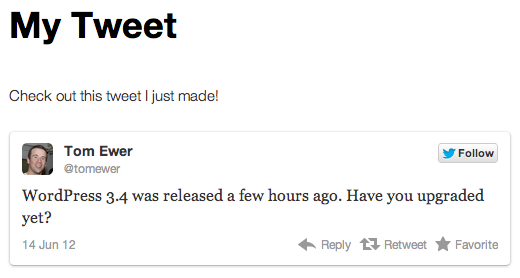 They’ve taken that one step further in 3.4, with the inclusion of embedded tweets. Embedding tweets is a great way of boosting follower rates and re-tweets, so don’t be afraid to use it liberally now that it is so easy with WordPress 3.4. Finally! This new feature has to take the prize for “longest time coming”. 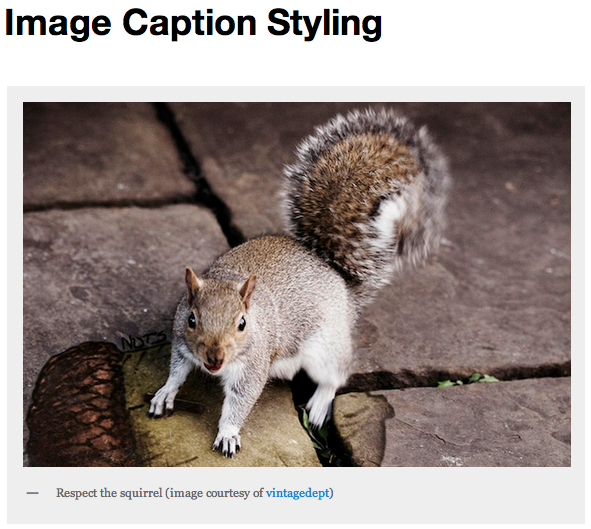 You can now add basic HTML tags to your image captions, which most importantly means that you can easily add links for attributions, and simple styling such as bold and italics. To be honest, it is rather embarrassing that it has taken this long for such a seemingly straightforward feature to be integrated, but now it is here, it is another box ticked. Faster WP_Query: post queries have been optimized to improve performance, especially for sites with large databases. Faster translations: the number of strings loaded on the front end has been greatly reduced, resulting in faster front page load times for localized installations. Also, better support for East Asian languages, right-to-left languages, theme translations, and more. Themes API: WP_Theme, wp_get_themes(), wp_get_theme(). Faster, uses less memory, makes use of persistent caching. The custom header and background API has been relocated into the theme support API. The introduction of a new WordPress API that supports custom content types and taxonomies. jQuery, jQuery UI, TinyMCE, Plupload, PHPMailer, SimplePie, and other external libraries were updated. jQuery UI Touch Punch was introduced. Various other minor improvements and bug fixes. As a developer, there is a lot to get stuck into here. Some improvements are simply efficiency-based, but others (such as better external library support) have the capacity to be more influential in future development. For a full list of absolutely every little tweak made in WordPress 3.4, check out the Codex and the Trac. So there you have it folks – WordPress 3.4 is now upon us, and comes bundled with a healthy set of new features. What are you first thoughts? Do you think the developers have done a good job? Or do you think that there are glaring omissions? Let us know in the comments section! Next blogpost:ManageWP for iOS Progress Update, And It Has A New UI Design! Thanks for the detailed info on what all new feature Wp 3.4 got.. Though, I will wait for sometime before updating, as many users in forum are reporting issues with media gallery. someone know where can i find “free themes” for wordpress 3.4?? how do I start the WordPress 3.4 Upgrade from my logged in Dashboard please? doesn’t seem to be any obvious links to do a core update. Once you were login into mangewp have you done a refresh?